How accurate does the sensor need to be? Is it the absolute colour that you need to measure or just colour detection. For measuring absolute colour, the sensor accuracy (measured in Delta E) will need to be high, in the range 0 to 1.0 ΔE. If you are unsure of the accuracy, speak to the sensor supplier for advice and guidance. What object or material do you need to measure? 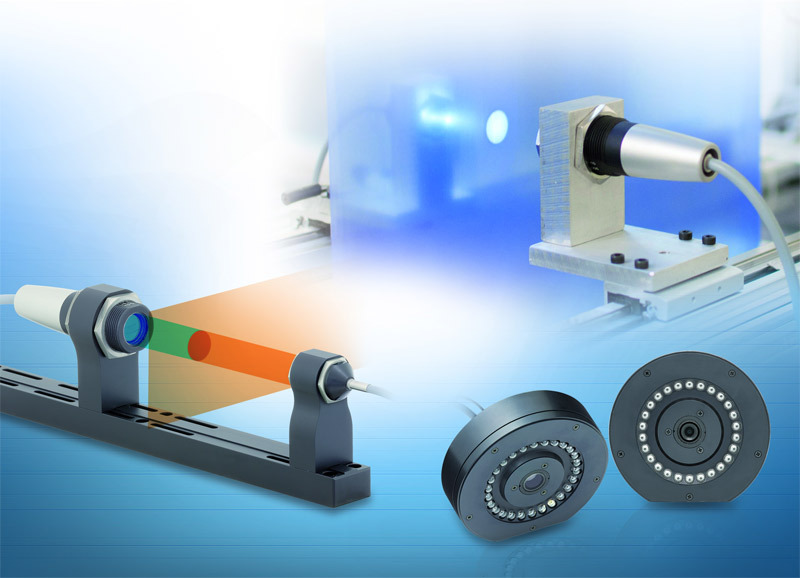 For non-contact colour sensors, the ideal surface in terms of sensor performance and accuracy is a flat, smooth one, where the same optics can be used. However, textured or structured surfaces can also be measured accurately by changing the measuring head on the sensor and/or the light source. In addition, multiple sensors can be used to measure at different measuring points on the sample and then averaging these values. Curved surfaces or samples can also cause problems for colour sensors. On a curved surface, the light from the light source is reflected back to the receiver differently compared to a flat surface. If the sensor controller is not set up to deal with this, the accuracy of the sensor will suffer. For a sensor to perform accurately, the measurement opening has to be fully covered and, as a general rule, the curved radius of the sample should be less than 10 times the diameter of the measurement field. Even transparent or translucent objects can be measured using a non-contact colour sensor. In many production processes, the temperature will fluctuate. If the colour sensor becomes too hot, its accuracy may suffer, i.e. the Delta E value of the sensor will change as the temperature increases. Therefore, look for a supplier that states clearly on the sensor datasheet how the accuracy of the sensor changes with temperature. Dirt, dust and oil will affect the accuracy of colour measurements. Non-contact colour sensors are more sensitive to contaminants in the measuring gap. Mechanical mounting of the sensor and maintaining the distance between the sensor and the target object is important, particularly if the sensor is integrated to an inline production process. Vibrations from the surrounding environment may move the sensor and therefore affect its colour measurement accuracy. In order to measure colours accurately, lenses are important. Clear glass lenses are used for large distances and matt surfaces, while sensors with diffuse lenses are used for inhomogeneous, textured and shiny surfaces. A polarizing filter is normally used for highly reflective surfaces. Sensors with UV LEDs tend to be used for fluorescent objects. Look for a supplier that can offer a range of different lenses across its sensor series. If colour measurements need to be made on high speed production lines, the inline colour measurement system will need to be integrated to other industrial control/quality control systems. The measurement system should therefore provide a range of connectivity/networking options including digital interfaces such as Ethernet, EtherCAT and RS422. These interfaces allow colour measurements to be monitored remotely. Unlike conventional inline colour measurement systems, the latest advanced systems recognise colours not only by comparing them to reference values, but also by using the reflection spectrum to ensure unique identification. Most suppliers will provide their colour sensors with a ‘teach-in’ function. This enables the sensor to learn and adapt to the application by using samples of the correct colour. Following this process, the sensors are able to compare the colour samples they have been taught with the target object, then operate independently, normally outputting a pass/fail signal.